Cedric Kipre admits he is still finding his feet at Wigan Athletic – but hopes it will soon feel like home. The 21-year-old Frenchman was thrown in at the deep end after his arrival from Motherwell, playing the day after signing for Latics in the 3-2 opening day win over Sheffield Wednesday. And while he makes strides on the pitch, Kipre, who has signed a three-year deal, hopes to soon be settled off it too. “I’m not quite settled just yet to be honest but I’m feeling good, training well, playing well,” the defender told the Wigan Post. But Kipre, a Paris Saint-Germain Youth Academy product, says staff at Latics are working hard behind the scenes to help him with his hunt for a house, so he can concentrate on football. “Karen (Armstrong, player liaison officer) is helping me a lot, she’s working hard for me to find a house and hopefully it will be sorted by this weekend,” he explained. 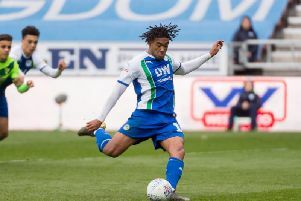 Kipre also thinks Latics have caught many off guard with their encouraging start to the season, which has produced seven points from five games. But he admits it’s too early in the season to think their place back in the Championship is assured. “Everything’s alright at the minute,” he said. “We were in League One last season so people were expecting us to struggle but we’re doing well. “We keep our feet on the ground. It’s only the start of the season. But Kipre is planning for the long-term, and hopes he can contribute to another season of success under Paul Cook. He said: “I want to keep playing, keep playing and hopefully stay injury free.